most of my co-bloggers says I'm a huge fan of UNIQLO.. hhhmm yeah maybe I am. Coz each time we meet for UNIQLO Philippines event and ask me about my views about it, I quickly replied them my knowledge about the brand, the product, its background per se.. well, your belle doesn't want to come and attend to the event without being prepared.. If you have read my blogs about UNIQLO's exciting event this coming June 15, you'll see how enthusiast I am to promote and remote, and USE UT UNIQLO and be part of my daily wardrobe. Anyway, I haven't post these candid shots for past weeks coz I'm focusing on spreading the brand, but now let me share to you, some of the behind-the-scene-pics, and my kinda funny comments. see that lady behind me? This photo makes me laugh and guess "What's this lady staring at?" hhhmmm feeling jealous? Well she must be! 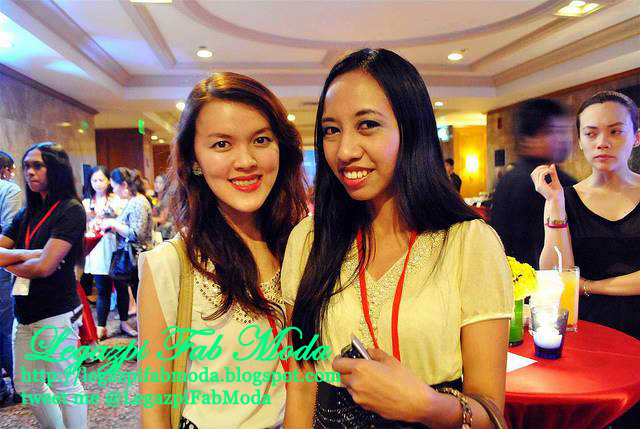 Thanks for Rovie Divinagracia for this lovely photo of me with Helen Blas, co-blogger.. I do admired (and feel proud) seeing this great photo of Mr. Katsumi Kubota, COO of UNIQLO Philippines together with his chosen Filipino Celebrity Brand Ambassadors namely, Chris Tiu, Nikki Gil, Iza Calzado and Chito Miranda. The photo says, "We are MADE FOR ALL, and ALL FOR ONE" I love it! ehem.. but.. I feel pretty here! Hahaha thanks for Helen Blas for this photo, she knows my angle.. love yah! ... hhmmm i LOVE Yellow! another photo with lovely Helen, thanks again Rovie.. wait where's Rovie????? OMG! I'm so glad that I've got a nice shoot with Kubota-san.. While taking this, he is explaining to us the mission and vision and the company's goal, and what is really meant by MADE FOR ALL UNIQLO. I can say it's a good photo.. why? Coz he seems looking at my camera while taking this, hahaha I like it..
hhmm a little bit political but cute! OMG What's these mess?! Oooppss! It's the giving of UT Souvenir Shirts! NO wonder everyone is excited for freebies! that's how GENEROUS UNIQLO are... is there like this with our Local FILIPINO Brand??? lucky I've got mine! It's a Hello Kitty UT Shirt yey! ayan pa with Chito Miranda, uber galing and kind! Jealous of this event? well you should not be, you have the chance to meet these guys this coming June 15, 2012 Friday at SM Mall of Asia for the grand opening of UNIQLO PHILIPPINES Flagship Store. looks like Uniqlo is set to make an impact in the Philippine market. thanks Rain! Now I know them, they are both lovely! I like your outfit! Wish to join more events! Wow star studded party, delicious food, and amazing show. What more can you ask for, right? cant wait for the grand opening! I love uniqlo! hahaha yeah, hope you've got your faves here!